Nowadays, it is impossible to run a business without stumbling over various lead generation software platforms. The ‘find all your prospects under one roof’ platforms are exactly what marketeers and sales people need and dream about. However, is your lead generation platform really delivering what it promised? Maybe it’s a bit too expensive and the annual package you’re paying seems exorbitant – and doesn’t really fit within your budget. Or maybe you have trouble navigating your way around a specific platform. We get dozens of complaints by prospects on a weekly basis with regard to interface software systems and how they tend to disappoint more than satisfy. Many of our customers come to us after a distasteful experience with such software. Their issues range within a myriad of categories – starting from the considerably high cost of these software to the overall user experience. With this in mind, the team at Cloudlead decided to do a little bit of research (both primary and secondary). Yes, this means we went directly to the source (ex-customers of lead generation platforms) along with various product review sites such as G2Crowd. Without further ado, let’s dive right into the details of the main problem areas our team found with lead generation software platforms. You would be surprised at the number of customers who are let down by the ‘dashboard experience’. Statistically speaking, many startups rush into signing up and purchasing annual software packages just to find out that they aren’t happy with the platform they’re using. But it’s too late since they’re bound by contract and have already paid a large sum of money. These are also key problem areas but will be discussed later. Let’s stick to the topic of the ‘User Interface’ trouble. -Many users feel that they’re being pushed into an ‘overload’ of information just to attain simple B2B contact and account data. A number of customers have reported that it is difficult to find their way across the complex platforms. Ranging from scattered and loaded data appearance to the trouble of having to remember each and every minute detail of such a crowded dashboard. -This being said, customers have also expressed their desire to have a more ‘user friendly’ display where the company search is easier. Oftentimes, during an advanced search, there are too many tabs with an overwhelming amount of information required. This could be cut and condensed, but lead generation software doesn’t really cater to these needs. -There is no possible way to tag an account on such platforms. You wouldn’t know whether certain company data is available on a particular software interface or not. This in turn wastes a lot of time because information cannot be pinned and processed as quickly. -Speaking of time and effort, sifting through data on software platforms also wastes a lot of time and energy. Sometimes the data is inaccurate (I know it might sound unreal- BUT this actually happens). Quite the irony that a data provision software could mess up the exact details of data. At times, company data isn’t relevant or updated. This shows a lack of data enrichment on such platforms. You could possibly be following up on outdated contacts, numbers and details which won’t lead you to a closed sale anytime soon. To make things worse, you’re bound by a contract…hence, you’ve become a prisoner of your own choices. -It would be an understatement to say that the ‘customer is important’. The main objective or rather mission of any successful business is to ensure that its customers are satisfied with the products or service. Realistically speaking, happy customers translate into increased sales, more referrals (gold in a B2B environment) and reduced churn rate. -Bottom line? Customer satisfaction can only be delivered through consideration. However, many former clients of lead generation software platforms have had bitter experiences in that department. They have felt insulted, less valued or even ignored. There is very little or close to no customer support. Complaints go unheard, especially after purchasing an annual package that customers are legally bound to and can’t get out of. -Once customers are tied to such restrictive contracts, they find it intimidating to communicate their issues. Even if they raise concerns with the dashboard or data accuracy, their voices often go unheard. -The worst that can happen to any customer is being bound in an agreement which they can’t get out of. What’s even worse? Your card being charged when you’ve explicitly stated that you do not want to renew a subscription! Go to any review platform such as G2Crowd and you’ll see a few users complaining about expensive annual packages and being charged repeatedly even when a customer wants to cancel a subscription. -Everything boils down to time consumption. Like they say ‘time is money’. It surely is within the marketing world, hence each company data detail matters. If it isn’t precise or accurate, then it wastes time. The more time wasted, the less sales closed. In essence, a confusing dashboard and inaccurate data can waste a lot of your time. -Not only are lead generation software dashboards time consuming, but have you ever considered their cost? Their annual packages are thrown in with ordinary features which bind customers through ironclad contracts. This means a huge chunk of money is cornered off. If you don’t like the dashboard experience, then you have to bear with it for an entire year. This means you’re not only wasting your time, but you’re also wasting money. The entire dilemma of committing to lead generation software seems tricky. As mentioned above, the overwhelming volume of data and ‘pick and choose’ process is not easy to use or understand – especially for busy marketeers or the sales force. Opting for customized B2B contact data lists give you the luxury of sitting back and being handed over targeted and precise data. Here is why custom data lists can give you better results. This data is verified multiple times and constantly updated to keep up with the high data decay rates. You won’t have to waste time scrolling through an entire list of companies and/or invalid contact numbers. To make things better, the chances of receiving enriched data with additional details is much higher in ‘customized lists’. B2B contact data companies such as Cloudlead specialize in providing relevant and accurate data which is not a given guarantee with many lead generation software platforms. Another factor to keep in mind is the ‘commitment’ issue. Lead generation software charges a premium price with binding annual contracts. You’re bound by a contract and it doesn’t matter if you realize later that the dashboard has too much data or that the UI is not user friendly at all. If you think it’s a time-consuming interface that gives you inaccurate data- well, tough luck because you’re stuck with it! Instead you could choose easy, customized and targeted B2B contact data lists that are tailored exactly the way you want. This means you’re involved with a ‘pay as you go model’ which means you’re ONLY paying for what you need. Today, the name of the game is personalization. Personalized approach, personalized communication – in short, people expect and demand a personal touch when they do business. Especially in the B2B industry, businesses (both small and large) prefer to work with vendors and partners who can provide excellent customer care and who care about their customers pain points. However, it is also not practical to research each and every prospect. The time, money and effort required to correctly pin down unique data points for each prospect can amount to a lot. And lead generation software platforms don’t give you much in the way of personalized data. Yes, they have the odd Linkedin and Twitter account here and there, but in no way is this list exhaustive. It is also not accurate many times due to unavoidable factors such as data decay. The solution? Custom researched data lists. Not to toot our own horn here, but B2B data providers such as Cloudlead recognize the huge demand for B2B data. Not just any data – accurate, verified and up-to-date data with unique data points. These verticals could include intent data, social profiles, use of specific software etc. In short, all the trigger points that signal a sales opportunity. The best way to compile such data is through a combination of machine learning tools and human verification. Even then, if the data is not cleansed on a regular basis, it can become virtually useless for customers. While software lead generation platforms are undoubtedly convenient, they are made unnecessarily complicated due to complex UI, bad data, lack of data points and just plain bad customer service. 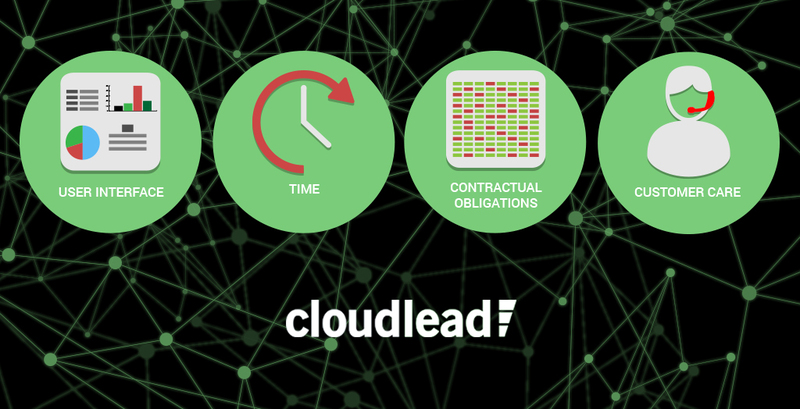 With these points in mind, Cloudlead has been developing a new type of Data Validator and Data Directory which would contain millions of accounts and contacts being verified/updated by a dedicated team of researchers. While custom lists still present the best opportunity to target new prospects and ex-customers, a lead generation platform which addresses the main concerns of prospects and customers will allow Cloudlead to truly stand out. Write to us here or at Hello@cloudlead.co. We would love to hear your thoughts on lead generation platforms and how they compare to custom data lists.